Akira Miyazaki, the screenwriter who was responsible for writing half a dozen of Nippon Animation's World Masterpiece Theater anime titles in the 1970s and 1980s, died on Sunday from bile duct cancer. He was 84. Japanese news agency Jiji Press reported Miyazaki's death on Monday evening. Miyazaki, who grew up in Tokyo and began his career in the film industry in 1961 at the production company Shochiku, had no background in animation before writing for animation productions. Prior to the mid-1970s, his screenwriting was limited to films and television dramas, and he eventually made his directorial debut in 1971 in Naitetamaruka. After his rise from screenwriter to director at Shochiku, Miyazaki was introduced by a friend to animation director Masaharu Endou at Nippon Animation. Endou, who worked on the landmark production of Tetsuwan Atom (Astro Boy) and was one of the leading directors at the newly established Nippon Animation, invited him to work on a new anime title. 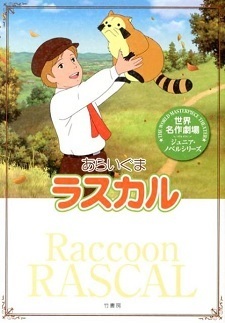 In 1977, Miyazaki made his debut as an anime screenwriter in Araiguma Rascal (Raccoon Rascal, pictured). Rascal was the third production in what would become Nippon Animation's World Masterpiece Theater series, anime adaptations of various works of children's literature. Miyazaki went on to write for five more productions in the series, including Perrine Monogatari (The Story of Perrine), Tom Sawyer no Bouken (The Adventures of Tom Sawyer), and Ai no Wakakusa Monogatari (Tales of Little Women). He retired in the early 1990s, but returned briefly in 2001 to write special episodes for the conclusion of Perrine Monogatari. Miyazaki's funeral will be held on Thursday, November 29, in the city of Wako in Saitama Prefecture. I'm unfamiliar with their work but regardless, rest in peace. How strange ... I have not found any news about the subject. I feel disturbed by what is happening right now. RIP. Some of my childhood anime are world masterpiece theater. I grew up reading his picture books. I really loved them and I'm glad that I crossed paths with him. Thank you for delivering all of these. I nearly have a heart attack whenever someone named Miyazaki dies on this site. Nevertheless he will be missed. RIP, I loved Rascal when I was a kid.